It was a rainy Wednesday afternoon when a Grand Forks man stopped in to his optometrist for new glasses. When it came time to pay, he pulled out his Choice Financial HSA debit card. It had been a long time since he’d used it, but he knew the balance was sufficient to pay his bill. When the cashier ran his card though, it was denied. 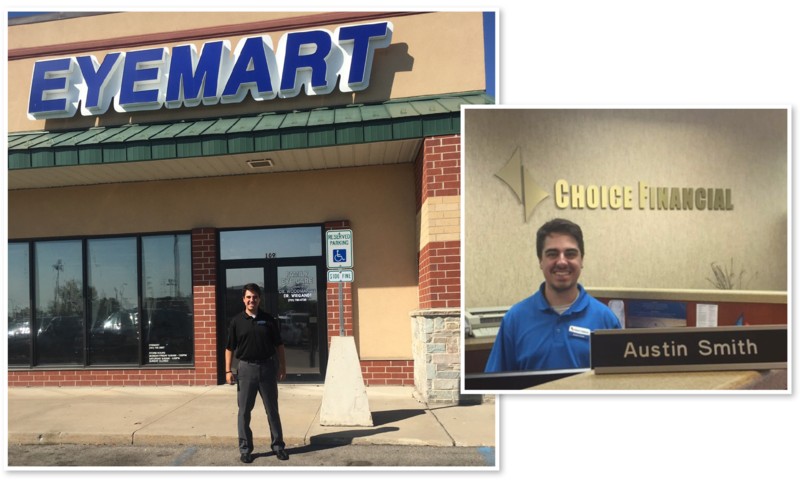 The gentleman called his local Choice branch to see if there was anything that could be done, and Austin Smith, Front Line Specialist answered the call. Austin found out that it had been over a year since the customer had used his card so the security feature had kicked in, automatically closing his card to protect against loss or theft. He told the customer that he could reissue it, but that wouldn’t be immediate enough to get the bill paid. He then asked the customer for the address of the optometrist, and offered to drive over and bring the cash to him. Know when to ask, and know when to offer” said Austin, paraphrasing one of Choice’s core values. “To me it wasn’t even a question. A customer needed something and I was able to provide it. It was still raining when Austin ran through the parking lot of the optometrist’s office, but when the customer saw his Choice lapel pin, his smile was like a break in the clouds. Austin delivered personal service (along with cash) because he puts people first and knows it’s just the right thing to do.